Mumbai, India-based IT services firm Tech Mahindra will acquire consulting firm The HCI Group for $110 million. 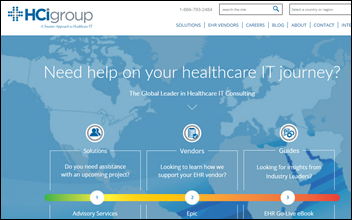 Jacksonville, FL-based The HCI Group reports annual revenue of $114 million and has 500 employees. Tech Mahindra has annual revenue of $4.2 billion and has 117,000 employees in 90 countries. It is part of the Mahindra Group conglomerate. Not a comment on your content, but I appreciate how open you are when you get something wrong, “(update: I incorrectly stated that new purchases reported to the SEC on Friday had raised Elliott’s ownership to 16 percent, but it remains at 8.3 percent).” It’s refreshing, and appropriate. Thanks much.